We had a really crappy night. My daughter is recovering from croup, so I’ve had a few bad nights in a row. Now my son has it, and he gets it substantially worse than his sister. I spent over an hour sitting on the lounge last night with Mr Almost-5 sitting on my lap trying to keep him calm. Keeping calm is a big deal when he gets croup. He wakes and feels like he has something on his throat, so he tries to cough it up. Except when he coughs or sobs, his throat makes a honking noise. When he realises he’s making this weird noise, and that his voice sounds different, it frightens him. The sound of the honking is so distracting it can make him hyperventilate, and then he thinks he can’t breathe. And then he panics that he’s never going to breathe or sound normal again. The more frightened he gets, the more his throat feels funny, the more he coughs, and then the more he sobs and the more he honks. It’s easy for the cycle to feel overwhelming. Fortunately (or unfortunately, depending on your perspective) his previous bouts of croup, combined with the fact that he’s generally a little on the anxious side, mean that I have a tried and trusted way to placate him. We count. I tell him he will feel better if he can think about something else and slow down a little, and ask him if he’d like to count with me. Aside from the fact that it helps regulate his breathing, listening to my quiet voice is soothing to him. And he actually enjoys counting too. After some stops and starts, I hit 227 before I noticed he wasn’t counting anymore, and had dozed off back to sleep. I planned to wait on the lounge just a little big longer to make sure he really was asleep, but then Miss 2 stumbled out to the lounge room, wondering why I wasn’t in bed next to her. After struggling back to bed with the both of them, I moved the wrong way and put my neck out. 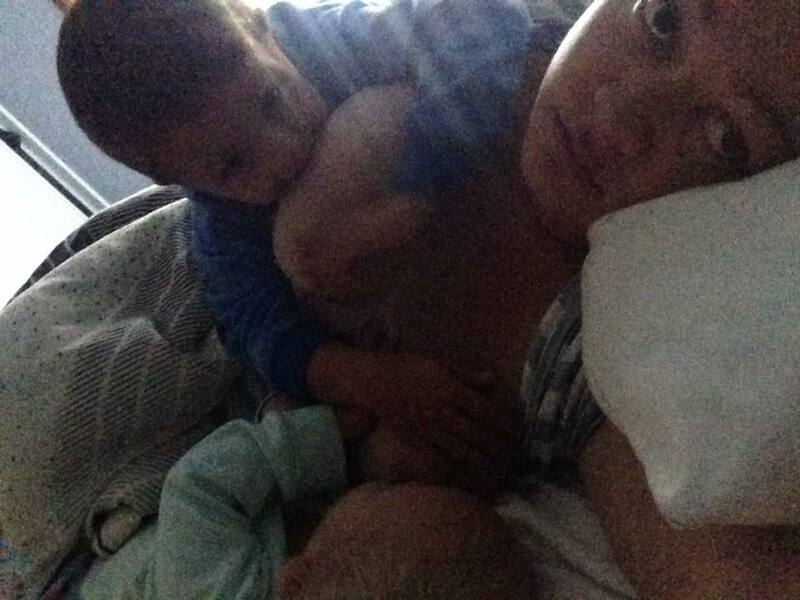 This is something that can happen to me whenever I get sleep deprived and breastfeed in bed more often than usual. It’s a physical manifestation of my stress and usually comes at a time when I feel least able to deal with it. So then I was in bed with one kid wanting to breastfeed, one kid wanting to breathe, both of them wanting to lie on my arms and a sore neck. Neither fully awake, just awake enough to protest if I tried to get myself into a comfortable position. And that’s how we spent the next few hours. Once the sun was up, Mr Almost-5 was insisting it was time for his morning. His insisting and my pleading that he wait until I’m done sleeping woke up Miss 2, so there went that idea. After satisfying them both, I lie in bed for a while, under the doona, hoping they’d forget I was even there, so they would harass Daddy for breakfast for a change. Not a chance. As I sit here nursing my sore neck with a hot coffee, I’m not exactly loving life. The only thought that gives me any comfort at all is that at least I’m breastfeeding them. However sick they are or have been, I am confident that without the immunological properties of my breastmilk, they would be worse. And on a day where I’m exhausted and sore, with no reprieve in sight just yet, I need to hold tight to that thought.